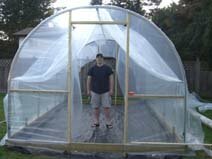 Solexx, does not currently have any distribution in Canada, they are leaders in their Greenhouse Designs. Also they are ahead for a system, available to market, for their 4 season grow 4 it kit. This includes one of their kits, along with the growing system. Solexx Grow 4 it: - as grocery prices rise people will search to become more self reliant, it is already happening. This is a complete system already in place. It is currently being tested. Over 150 current subscribers to the 123-greenhouse-gardening Newsletter. Keep informed of all new IM opportunities (such as Social Media). The New Way of advertising (classifieds and Yellow pages, Magazines, buy and sell - Dead – everyone goes to the internet). Brokering opportunities with Commercial Manufacturers and Hobby Greenhouse manufacturers.